For pretty much our first year of marriage, we used a blue handicapped parking placard that had my Granny's name on it. Nothing like a little parking fraud to start a marriage off right. I assumed that anyone who saw me loading and unloading my paralyzed husband wouldn't ask. I may or may not have used that parking placard once while dress shopping with a friend who had an aching back, but I digress. I want to share a little story with you. I hope this doesn't stir up too much drama, but if it does, oh well. Maybe we should just talk about it. A couple of weeks ago, Michael was planning on meeting me in the city to have dinner with some friends. Then, the plan was for us to metro back together, and drive home from the metro station. So, that morning, I parked in a handicapped parking spot. Michael refers to these as "blue spots," but I'll call them handicapped parking spots because that's what everyone else calls them. As I was loading my computer bag out of the SUV, a man who was walking to the elevator stopped just short of my vehicle. "Excuse me," he said. "Are you handicapped?" I was completely caught off guard. Was he talking to me? "Well, I noticed that you're parked in a handicapped parking spot, and you don't appear to be handicapped." "Oh, my husband is in a wheelchair. He's meeting me in town today, and we're coming back later. I'm parking here because I will need the space to load him." But NO, this dude went on and on, telling me that there are always lots of spaces at the end of the day, and I could always park in a 'regular' spot now, and move my car later!! I really, really wanted to light him up with the very glamorous details of my husband's life as a quadriplegic, and my life as his caregiver, but, I didn't. I smiled, and said, "Have a nice day, sir." Then. I took the stairs. Because that guy probably would have had a whole other lecture about me and my two healthy legs going on the elevator. Here's the thing. 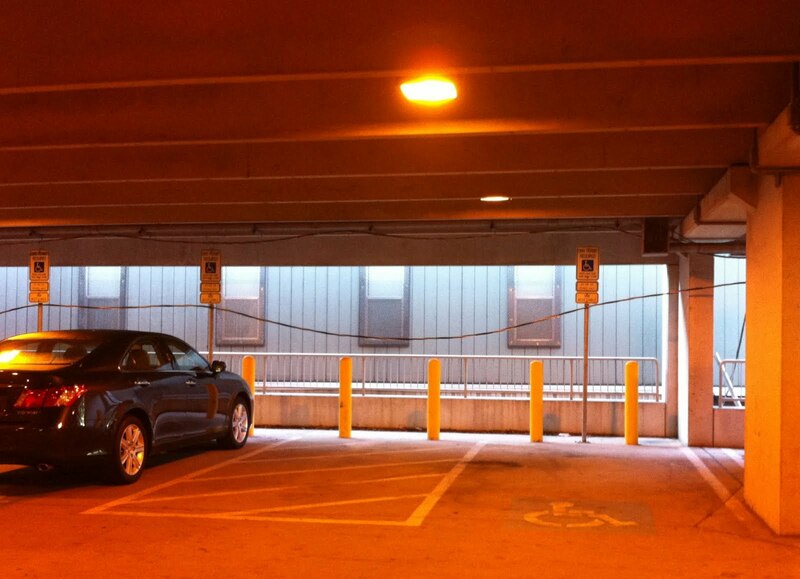 Should you really call someone out who parks in a handicapped spot that doesn't 'look handicapped?' I say no way. Because what if I had two prosthetic legs under my pants? What if I had a heart condition? Or a lung condition that you cannot see? There are so many disabilities that you cannot see, people! I know people abuse handicapped parking spots! Some people lack human decency. Some people don't follow the rules. Heck, there have been many times that Michael and I have had to park in a 'regular' spot, and I've had to back the SUV up into traffic to load him! I know this. But, still, I would never call someone out. Because that's just being overly dramatic, I think. Because, even for us, if some 17 year old with his great-grandmother's parking placard was parked in the spot we needed, we could still get around it, somehow. And if that kid had any level of human decency, and working eyeballs, he would see the guy in the wheelchair being lifted into the SUV by his wife. And, he would feel something. Now, back when Michael had that giant, red, wheelchair van, that needed 1,500 square feet of clearance all around to let the lift out. That's a different story. Mama, I figured, haha! What is an "EW?" Oh. My. Goodness! You have a thicker skin than me, girl. I would have been a blubbering mess walking up those stairs (a blubbering mess thinking of ALLLLLL the comebacks I wish I'd been witty enough to say on the spot!) That makes me mad just hearing about it. Ha! this makes me laugh. I am currently on bed rest (and have been for the last 14 weeks) and am not supposed to be driving. However, 3 weeks after I got put on bed rest, Scott (my hubby) had a grand mal seizure and has since been diagnosed w/ epilepsy. He is not allowed to drive for 6 months according to Georgia law. SO, here I am on bedrest for pregnancy, 3 kids w/ a 4th on the way and husband that can not drive! So, I talked to my doctor and she agreed to allow me to drive as long as I am just the "driver" and she gave me a temporary handicap parking placard. I often wonder what people must think when they see a very obvious pregnant woman get out of the drivers seat and a very able bodied man get out of the passenger seat and then he proceeds to unload 3 children! I am JUST WAITING for someone to say something...I will be ready! You are so right...there are so many reasons people would have handicap parking decals that would not be noticeable. Of course, just being pregnant does not make me handicap but the high risk nature of this pregnancy does...but you can't tell that by looking at me! Be careful with the placards. We live in an apartment complex and have been parking in the same spot (handicapped) every day for the past 2 years, it's like "our" spot and almost everyone knows it. My boyfriend's placard was still from NY where he lived. We live in CA now. One day when I had to run out and pick up my son at 4 in the morning, I was super tired and forgot to put it back up when I got home. I got a $250 ticket. Then it broke and the tape wasnt holding so we put it in the window. The same officer came back the following week and "didn't see it" (I thought cops were supposed to be observant? LOL). I got another $250 ticket. We wrote a letter to fight it and everyone from the parking administration to the police said that the tickets would be dismissed as they are 99.9% of the time. They weren't. The officer who makes the call said the placard was illegible because it is worn and faded from the sun. You can still read the numbers and issuing agency, they are just to lazy to run it. We had a sargent look it over and he said it was fine and valid and couldn't believe it but there is nothing they can do once a ticket is written. We are still fighting it. My boyfriend was born without any legs and uses a wheelchair. I wrote an even better letter this time adding a picture of my boyfriend holding his placard in front of my car with the license plate showing. LOL It's rediculous!